Please accept my respectful Namaskar. I beg to inform you that your speech on 2/8/58 at the Gurukul University Hardwar, has given me some inspiration to inform you something about Indian culture. The basic principle of Indian culture is spiritualism which defies the external attraction of phenomenal materialism. You are thinking of adjusting western ways of material adjustment with Indian culture of spiritualism and I beg to give you herewith the clue that materialism conducted with an aim of reaching spiritual perfection, is the right adjustment of human activity. If the aim of spiritual realisation is missed, the whole plan of materialism is sure to be frustrated and that is the law of Nature. The law of nature is so made by a superior authority and no body can surpass the intracies of material nature simply by partial adjustment of material science. The history of the West beginning from the time of the Greeks and the Romans down to the modern age of atomic war -- is a continuous chain of sense gratificatory materialism and the result is that the westerners were never in peace within the memory of 3000 years of historical records. Neither it will be possible for them at any time in future to live in peace till the message of spiritualism just suitable to the present age does not reach their heart. Therefore India may not waste her time in imitating the western way of life. You have admitted it that the position of India's culture is of very high order. But at the same time you want to bring in material prosperity of India by scientific advancement of knowledge. And what is that scientific Knowledge? Spiritualism is also advanced scientific knowledge. Material advancement of scientific knowledge cannot give even the desired material prosperity to the people in general without spiritual help. Swaraj of Mahatma Gandhi was adjusted in spiritualism more than materialism. Do you think that horseless carriage or telephonic or radio communication or any other such ephemeral facilities of life, can bring in material prosperity? No it cannot. 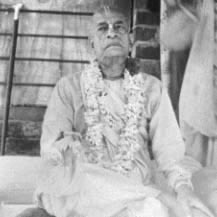 Material prosperity means that the people must have sufficient to eat or to maintain the body and soul together in sound health for further development in spiritual consciousness which is conspicuous by its absence in the sense gratificatory life of the animal. Do you think that your different plans have brought in that standard of material prosperity or that modern western civilisation can bring in that ideal prosperity? Even they are given all the facilities of material need yet the unrest will continue to go on till there is spiritual satisfaction of life. That is the secret of peace. Both the Americans and the Russians are better materially advanced and although they have different political philosophy of life till they are not materially happy and peaceful because both of them are unconsciously hankering after spiritual realisation as the child cries for the mother without expression by language. You can help the people of the world for satisfying their spiritual hankering as the true Indian messenger of peace. The world has recognised your sincere effort for endeavouring peace in the world and this is the suitable time to help your friends and at the same time glorify the standard of Indian spiritual advancement of knowledge for world peace. Please take up the matter in cool brain. Poverty means poverty of knowledge. Prime minister Chanakya Pandit used to live in a thatched house or cottage but he was the dictator of India in the days of Emperor Chandra Gupta. Mahatma Gandhi your poltical Guru voluntarily accepted the ways of the so called poor Indians and still he was the dictator of India's destiny. But was he actually poverty stricken on account of his plain living with the primitive charkha? He was always proud of his spiritual knowledge. Therefore it is the spiritual knowledge which makes a man really rich and not the radio set or the motor car. Please therefore try to understand this position of Indian culture and try to give it to the western brothers in the prescribed standard method of the liberated persons and that will be an exchange of Indian culture with western material advancement and necessarily bring in a happy life in the peaceful world. Here is a programme of spiritual movement (an appeal enclosed herewith). I am struggling alone very hard to give it an effective shape without any help from persons like you. You can help the movement a lot without the least difficulty or disturbances. My humble advice to you, as I am your old friend from Allahabad, is that you should now take leave from your present responsibility of Prime ministership and as you are a popular gentleman of the world you can just engage the rest of your most valuable life in this organised spiritual movement to achieve the aim of your life which is yet to be known by the ______ the world. By pushing on this authorised spiritual movement you can make a real adjustment of the western material science combined with Indian way of spiritual realisation. Please therefore think over this proposal very seriously and let me know your reaction upon it and oblige. If you can spare a little time, I am sure to convince you about its importance more quickly. Thanking you in anticipation and awaiting your early reply.